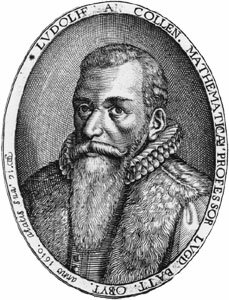 In mounting his assault on the number, Ludolph used the same weapons that the Chinese and the Greeks (like Archimedes) had both used more than a thousand years earlier. In other words, it was a pretty old-fashioned method. He used what we now learn in high school geometry to compute the area of shapes with more and more sides. Think of a circle as a regular polygon with an infinite number of sides. Ludolph came pretty close to that — 32 billion. Imagine him spending years hand-calculating the area of a 32 billion-gon. Whew! At one point, he published 20 digits in a math book, and by the end of his life of geometry and swords, he had found the first 35. So proud was Ludolph of this grand accomplishment that he had the numbers engraved on his tombstone. Sort of a personal Guinness record book. But the grave was actually swapped by his widow (presumably for something less nerdy) shortly after his death, and the stone changed hands a few times and was eventually re-cut to fit into a pillar in the nearby St. Pieter’s Church. It’s a good thing we didn’t need that grave for mathematical purposes; just 11 years after his death, a Dutchman named Willebrod Snell found a much, much faster way to do the same calculations that it took Ludolph a lifetime to do. As the 1600s marched on, Isaac Newton started up calculus, and fancy trig functions (arctangents) became the new style for pi calculation (100 digits were known by 1706). Oh, how time flies. But to honor Mr. van Ceulen’s painstaking devotion, Germans still sometimes refer to it affectionately as “the Ludolfian number.” Next time you’re in a fencing competition in Germany and someone asks you what you call that one circle ratio, keep this in mind.